There’s nothing worse than worrying about your breath. Maybe you ate poke with Maui onion and garlic before your big meeting. Maybe you meant to brush your teeth after lunch, but didn’t get around to it before picking the kids up from school. Maybe you’re just thirsty. But don’t worry. Here are a few easy ways to keep bad breath at bay. Dry mouth is the leading cause of bad breath. 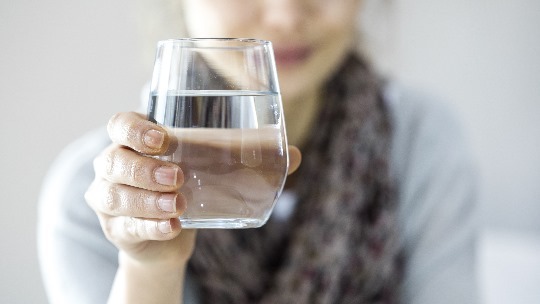 Dehydration and some prescription medications can cause dry mouth. Many people use mouthwash to counteract bad breath from dehydration, but drinking water is a better solution. Mouthwash dries your mouth out more, making your breath worse. Drinking water increases the production of saliva, which helps regulate bacteria. If you think your prescription meds are giving you bad breath, talk to your doctor about medications or mouthwashes to counteract dry mouth. A clean tongue can make a huge difference in the way your breath smells. If scrubbing with your toothbrush isn’t getting your tongue as clean as you’d like, try a tongue scraper. This inexpensive tool is great at removing the remaining plaque for a fresh, clean feeling. Tonsil stones are hard deposits of sulfur-producing bacteria and debris, like food particles and mucus, that get lodged in the tonsils. They calcify, turning into hard yellow or white formations with a pungent smell. You may be able to see them depending on their size. Unless they’re making it difficult to swallow, you don’t have to remove them. But if you want to improve your breath by reducing production of tonsil stones, brush twice a day, drink water after meals, limit dairy intake, and avoid drinking alcohol. Staying away from foods like onions, garlic, and dairy can make a huge difference. But the basics —brushing, flossing, and drinking water — are still the best and easiest ways to get rid of bad breath.